Description: The College of Arms is the official repository of the coats of arms and pedigrees of English, Welsh, Northern Irish and Commonwealth families and their descendants. 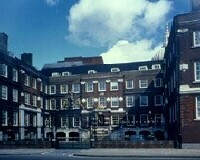 Its records also include official copies of the records of Ulster King of Arms the originals of which remain in Dublin. The officers of the College, known as heralds, specialize in genealogical and heraldic work for their respective clients. Coats of arms have been and still are granted by Letters Patent from the senior heralds, the Kings of Arms. The College's library houses not only the roots of every old family in England and Wales, but many historic relics such as the ring, sword and dagger taken from the dead body of James IV of Scotland after the Battle of Flodden.